Here are answers to questions that have previously been asked that you might find useful. The College is very centrally located. We are just five minutes walk from the bus and train stations and approx eight minutes from the Edinburgh Q-Park car park. We are able to reserve a parking space for disabled guests. However there are no other parking spaces available. Suppliers can pick up and drop off deliveries from the rear entrance of the building. All rooms on the wedding level are fully wheelchair accessible and there is also access to a disabled toilet. There is a wheelchair lift situated at the rear of the building which accommodates most wheelchairs, with a weight limit of 225kg (including passengers weight). We would ask clients to note that specially adapted models may not fit the 750mm x 840mm platform however the College does have a wheelchair which will fit onto the lift if the guest is able to use it. Please contact us in advance to advise of any accessibility requirements. Who will look after my booking? The Events Department is made up of a team of four and, once confirmed, your Wedding will be assigned to a member of the team who will be your main contact in the run up to the day. Approximately one month before the wedding we will go through a checklist with you to confirm your requirements. You are very welcome to contact us at any point if you have any queries or would like to come in to view the College. Will our wedding be the only one taking place on the day? Yes it will. You will have exclusive use of all the historic rooms (Great Hall, New Library and Cullen Suite). If a conference is taking place on the same day we will arrange a separate entrance for delegates to access the Conference Centre which is in a different part of the College. Please note that if your wedding takes place on a weekday College staff may need access via some of the corridors but not the main function rooms. I’m having a Civil Wedding Ceremony, what do I need to do? I’m having a Religious Wedding Ceremony, what do I need to do? The College does not require you to do anything. All arrangements should be made through your celebrant. What does my quotation fee include? Your fee includes exclusive use of all the historic rooms, hire of our tables and chairs; services of a duty College Officer and Doorman. VAT is not charged as we are a registered charity. Can a Master of Ceremonies be provided? 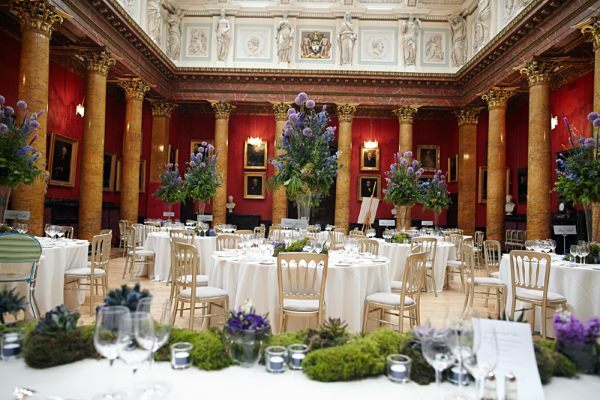 We suggest you appoint the chief usher to carry out master of ceremony duties or alternatively your caterer will be happy to provide a member of staff to perform this role. Our duty College Officer is principally there for your safety and not to perform other duties such as this. Where can we have photographs taken? Photographs can be taken in any of the historic rooms. In addition, if the weather is suitable, photographs can be taken in the Physic Garden or by prior arrangement in Queen Street Gardens. Is there a room that can be used as a dressing room for the bridal party? We do have a bedroom in another part of the College that you are welcome to use as a dressing room. We would be happy for you to come and view this room prior to the big day. Who will provide my catering? We have a panel of four catering companies from whom we ask you to choose. They will be able to provide sample menus, will be able to answer all of your catering queries and have worked within the College many times. No. We ask you to choose from our list of approved caterers to maintain standards and also to comply with the necessary health, safety and insurance regulations. Can I supply my own drinks? Yes, with agreement from your caterer, as corkage charge will be made by them. The caterer will provide staffing for the bar. Yes but please advise your caterer as a license has to be obtained when selling alcohol within a venue. Can you supply additional items such as table linen, chair covers, cake stand and highchairs? The caterers can assist with supplying these items. Can you supply a crèche facility? We can set aside a room for use as a crèche. However, all children must be supervised at all times. Is there a quiet area for guests? Guests usually find that the New Library and Cullen Suite are quieter areas to sit in. Am I free to choose the music/band/DJ and florist etc? Yes, however if you need a bit of guidance please see the list of suggested companies that has been compiled using suppliers previously used by clients. Can my photographer, florist or DJ visit the venue in advance of the wedding? Yes, we would be pleased to show them around. Please ensure they contact us to make an appointment. Do you have preferential pricing with local hotels? Yes we do. Please ask our team for the Recommended Hotel list and quote the Royal College of Physicians of Edinburgh when booking. Is there a place we can store presents? Yes, we can provide an area to store presents for the evening. The College cannot accept responsibility for any loss or damage to the presents. You should appoint someone to be responsible for the collection and removal of the presents. As the College often has bookings the day following a wedding we would ask for everything to be taken away on the evening. Whilst it is not a condition of our let, we would suggest looking into taking out insurance. This is especially formulated and covers items including damage to bridal wear, loss of wedding rings, damage to wedding cake, failure of suppliers etc. The College has public liability insurance but this does not extend to any of the above mentioned items. Do you allow confetti to be thrown and candles at the venue? Unfortunately we do not allow confetti to be used inside our venue. Candelabra and candles in holders are permitted to be lit on tables in the Great Hall only. Lit tea lights in holders are also allowed along the mantelpiece in the Great Hall. We do not allow real candles to be lit in the New Library and Cullen Suite, however unlit for decoration or LED battery operated candles are allowed. What decorations can I have at the venue? As a historic venue we naturally need to preserve the fabric of the building but there are ways to decorate without causing damage. Helium balloons are not allowed as we are unable to retrieve any that escape up into the high ceilings. Please discuss your requirements with our Events Team. Yes, we have a PA system in the Great Hall and can provide stand, handheld and lapel microphones for speeches as required. Can we play our own background music? We have an iPod dock so that music can be played through the PA system in the Great Hall during dinner. We have a portable CD player/ Ipod station in the new Library which can also be moved to the Cullen Suite throughout the day. What if guests want to smoke? In accordance with the law in Scotland smoking is not permitted anywhere inside the College or in the Physic Garden. Guests wishing to smoke should make their way outside to the front of the building onto Queen Street. Can we deliver items before or on the day? Yes, deliveries can be made the day before and on the morning of your Wedding in agreement with your coordinator. We will have a designated space for you to store items on the day prior and throughout the day of your Wedding.